Baxter Building Ep. 48: "That's Hardly A Ringing Endorsement, Kristoff!" - Wait, What? Previously on Baxter Building: Was there ever life before Tom DeFalco and Paul Ryan’s Fantastic Four run? By this point, it’s genuinely hard to remember what this comic used to be like, but I’m pretty sure it didn’t involve Reed Richards being dead and his place in the team kind of being taken by Scott Lang, Ant-Man. Or… did it…? 0:12:25-0:31:31: Fantastic Four #397 opens a four-part storyline that asks the important questions like, “Does anyone actually care about the Watchers?” and “Has their stolen Skrull spaceship always been called the Stealth Hawk?” Along the way, Jeff and I also discuss Lyja’s poor self-esteem, cheap travel tricks for shape changers and whether or not Nathaniel Richards is everyone’s Daddy, not to mention the one thing you really shouldn’t do with deadly technology. 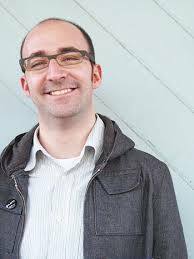 0:31:32-0:46:21: You didn’t know that you’d tuned into this podcast for Jeff’s impression of Tom DeFalco as Beat Poet, but with FF #398, you’ll soon understand. But don’t lose interest after that, because there is an especially lame reveal about Flaming Sue, the start of Jeff’s love affair with Kristoff, and the debut appearance of some Inhumans you’ll almost certainly immediately forget about, as well. 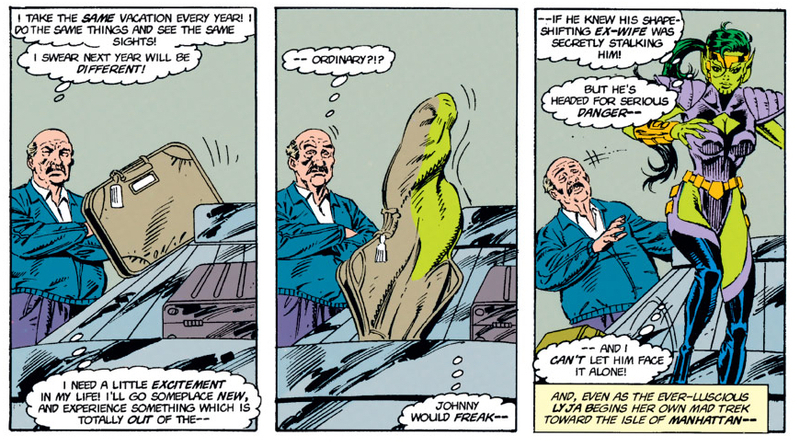 1:05:55-1:09:05: We take a brief interlude as I summarize what little everyone needs to know about Fantastic Force #7, which crosses over with the current FF storyline and reveals why Sue isn’t dead, while also exposing how stupid the Fantastic Four apparently is. 1:09:06-1:26:24: It’s Fantastic Four #400, the final anniversary issue of the entire run, and one spent with a story that is exhausting in its ridiculousness. It’s the Watchers versus the Celestials, except it’s not; it’s the Fantastic Four and Fantastic Force versus… Aron the Watcher, I guess? And the innards of a Celestial, even though it really shouldn’t be like that? 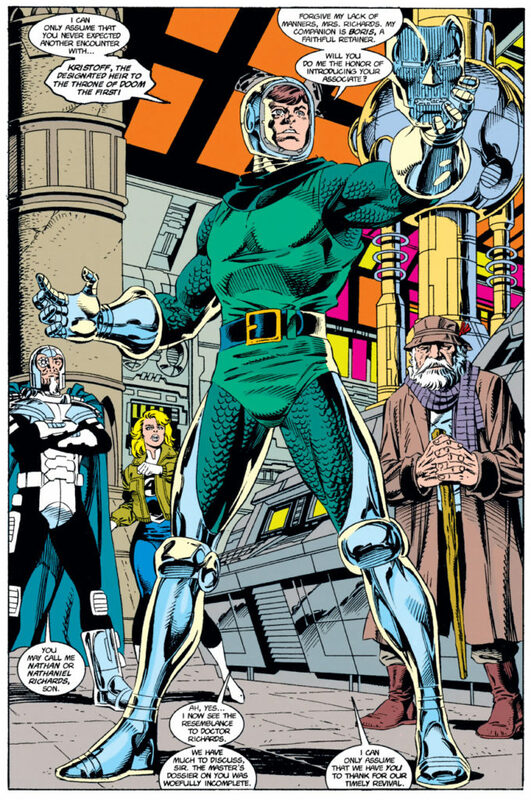 But at least there are random guest appearances, an essay about the history of the series that suggests that no-one actually wanted the job of writing it, and a memorial for Reed Richards. Is this… progress…? 1:26:25-1:27:54: Another aside, as I introduce Jeff to the plot complexities of Fantastic Four: Atlantis Rising #1, the first issue in the crossover that’s going to swallow the book whole for a couple of months. Come for the destruction of the Watcher’s house, stay for… I don’t know, actually. Maybe we should all leave. 1:27:55-1:35:27: Atlantis continues to rise in FF #401, in which Maximus seems to think there’s something more special about the Human Torch than Jeff and I do, and we discuss Nathaniel Richards’ novel approach to theft, especially the theft of tiny little miniaturized cities. Thor’s appalling costume is commented upon as well, and not for the last time. 1:37:03-1:46:28: What is the most enjoyable thing about Fantastic Four #402? It just might be the fact that Namor really doesn’t take directions to just calm it down a little very well, unless somehow leaping through windows and having fights that aren’t quite as dramatic as Tom DeFalco wishes you thought they were is his version of calming things down. Which is… not impossible, really. Also! 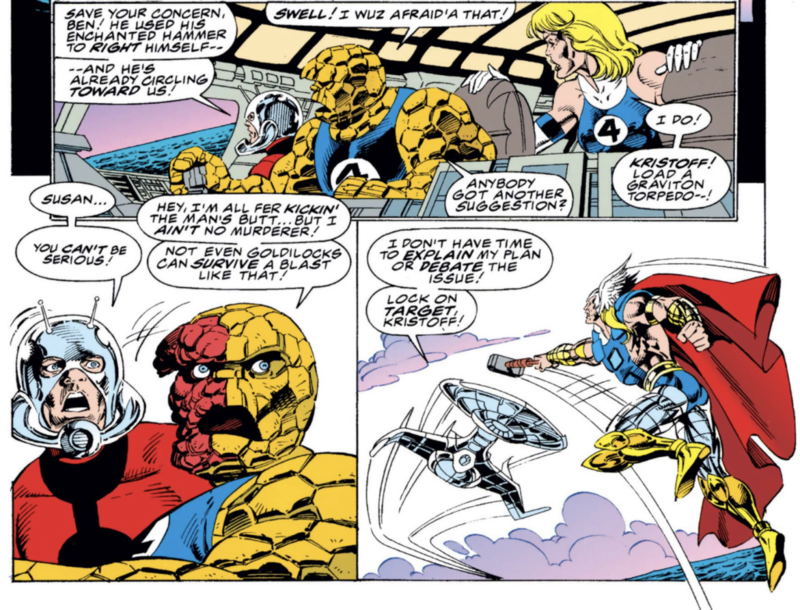 Sue Storm without Malice is being written just like she’s still possessed, and the Fantastic Four has the perfect solution for getting rid of the Norse God on the roof of your space ship. 1:46:29-1:47:45: I could exaggerate and pretend that I recapped Fantastic Four: Atlantis Rising #2 to close out the crossover, but I’ll level with you; I mostly just complained about how bad it was. Sorry, all. 1:47:46-1:59:27: Hey, who remembers that whole thing about an archaeologist finding a statue of the Thing from 20 issues or so ago? 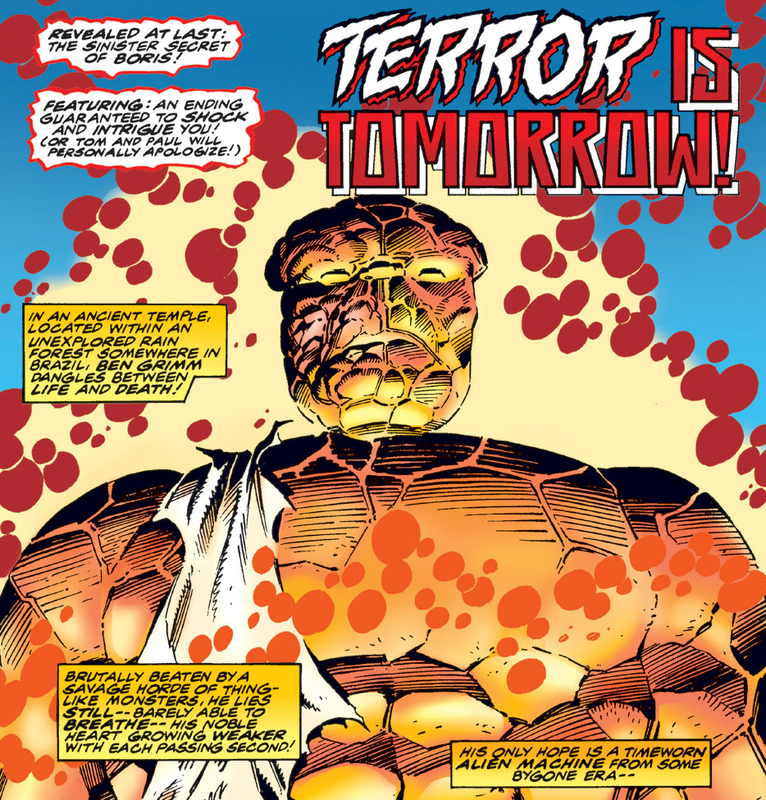 Tom DeFalco, who tries to bring that storyline to a close for reasons that defy explanation in Fantastic Four #403. But who cares about that when Kristoff and Johnny Storm are flirting with Scott Lang’s daughter, who is of an entirely indeterminate age because Paul Ryan can’t draw anyone between the ages of, say, 5 and 35? Not Jeff and I! 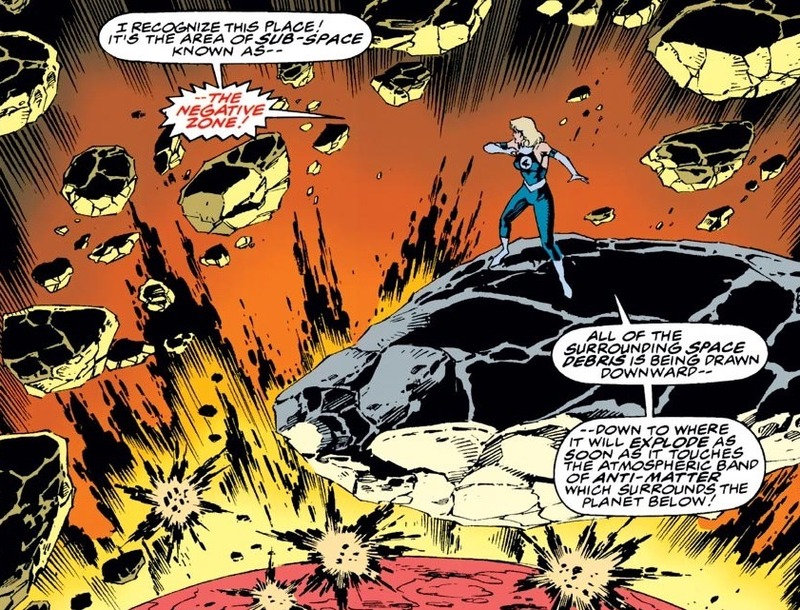 1:59:28-2:03:41: FF #404 sees the Thing take on lots of other Things, and Sue Storm as a Thing take on both Namor and her feelings, because… oh, who even knows at this point. Meanwhile, Boris, Kristoff’s faithful manservant proves that he can’t do something as simple as say, “Eh, I haven’t seen your kid,” and all hell breaks loose, because why not? That’s just the kind of comic we’re reading by this point. 2:13:37-end: We careen towards the end of the episode by talking about last-minute rewrites, the sense of exhaustion apparent in everyone by this point, and look forward to what we’re doing next episode, which is… Fantastic Four Annuals #24-27. The end is in sight, dear friends…! But don’t forget our Instagram, Tumblr and Twitter in the meantime, not to mention our Patreon. As always, thank you for listening and reading along, and I promise, our DeFalco/Ryan nightmare is almost over. Tom DeFalco is bad, and all of comics should feel bad. Complete agreement with Jeff Lester about Kristoff. He’s great, and I really felt that he gave the book a shot in the arm. I have a suspicion that he influenced Hickman’s Bentley Whitman, who was one of the more successful things about Hickman’s run. My theory is more-or-less as follows. I don’t get that sense that DeFalco (or DeFalco/Ryan, depending on what you think) doesn’t care that our hosts do. I do think that he’s writing very quickly and making it up as he goes along, and is trying to combine that with the Claremont thing of throwing out subplots continually to which he may or may not return. But I think he has a very clear and specific idea of what a Fantastic Four comic should be, which is that it’s this long-running story that should have absolutely nothing in it that’s not in some way an outgrowth of previous continuity. That as the oldest Marvel comic, it should be the one that’s most tied to its own tradition. That your job as the writer is to try to find new twists on those things which can’t ever be too new. That’s mostly not an approach that’s very productive. But if you roll the dice often enough, sooner or later you will get two sixes, and that’s what happens with Kristoff. (I’d say that it sort of happens with Lyja, too, who up to this point has been the most successful thing about the book, despite DeFalco’s best efforts to write her in a hellishly sexist way.). Kristoff is absolutely brilliant in this version. Some of that’s for obvious reasons. He’s a weird kid for a weird family. His hilarious/twisted obsession with Doom parallels DeFalco’s own obsessive relationship with the legacy of earlier FF runs, Some of it’s just because it’s genuinely exploiting potential in Byrne’s idea that Byrne, with his reverent seriousness, could not exploit: that it’s funny to have Doom’s distinctive dialogue and attitude come out of the mouth of a little kid. And some of it’s just that alchemy where a character works with this particular set-up. As Jeff Lester noted, Kristoff’s presence does wonders for Scott Lang’s presence in particular. But not when he’s talking to Kristoff. Then it suddenly feels like Lang is actually part of this story. Anyway, Kristoff did wonders for my enjoyment of these books, too. Oh, and one other point. While it’s important to keep in mind how this run is obsessed with trying and failing to be Jack Kirby, at this particular time, one should also note how it’s trying and failing to be Stan Lee as well. I don’t think DeFalco doesn’t “care”, at least not on the level of a Brian Bendis, but he’s pretty damn lazy. I’m not so sure. Because, honestly, I don’t see what’s so different about DeFalco’s slipshod plotting here from classic Claremont X-Men. 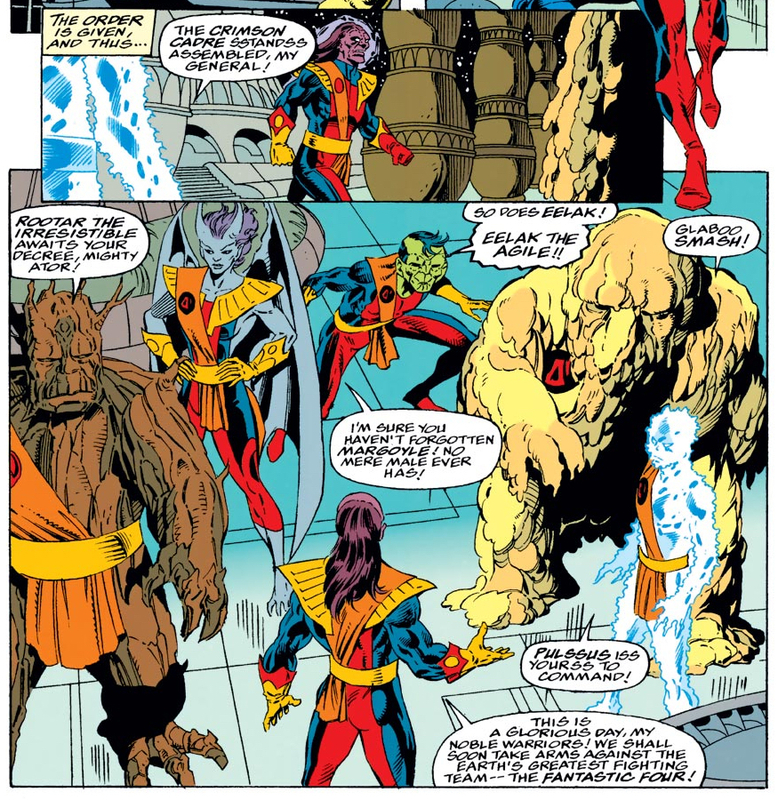 That’s full of dropped plotlines and stuff like the Thing head, plotlines where Claremont throws out a random plot point and comes back to years later, when – and if – he feels like it. But Claremont is *good* at this approach to plotting, and DeFalco isn’t. Claremont knows how to make those throwaway minor plot points to which he never actually comes back seem portentous and full of significance, so that you don’t care that, taken as a whole, nothing really hangs together. But I’m not sure that it’s because DeFalco isn’t trying – I think it might be because it’s just not an approach that suits him in the first place. He’s hobbled by Ryan’s pedestrian style, too. I think this might have worked much better if the individual moments had felt more dramatic. One can forgive a lot of incoherence in a superhero comic if it’s for the sake of effective individual moments. If I had to speculate on DeFalco’s plans, he originally planned the FF to travel to Aztec times during the story they go to the future, but he changed his mind halfway through and lost interest. He has to know the end is near now because he’s actually finishing stories and wrapping up loose ends. I didn’t manage to read all of these before I listened to the podcast and listening to you discuss these comics is much more enjoyable than reading them. 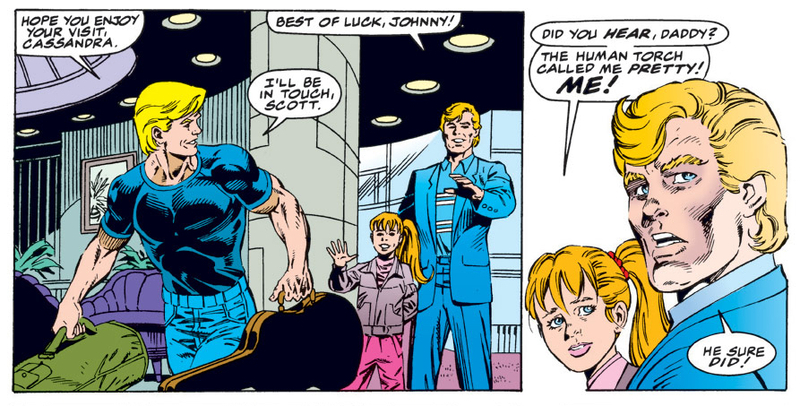 I doubt I’ll ever read the rest, although I’m almost tempted to see if there’s an explanation for why Johnny is carrying a very slim guitar case. I had wondered if Nathaniel had reprogrammed the castle robot guards to be extra unctuous, which then spiralled into wondering about general voice choices for robots. Also, when the Inhumans fired on the Stealth Hawk I was a little surprised, as I had supposed the Stealth part of the name suggested a ship that was hard to detect. 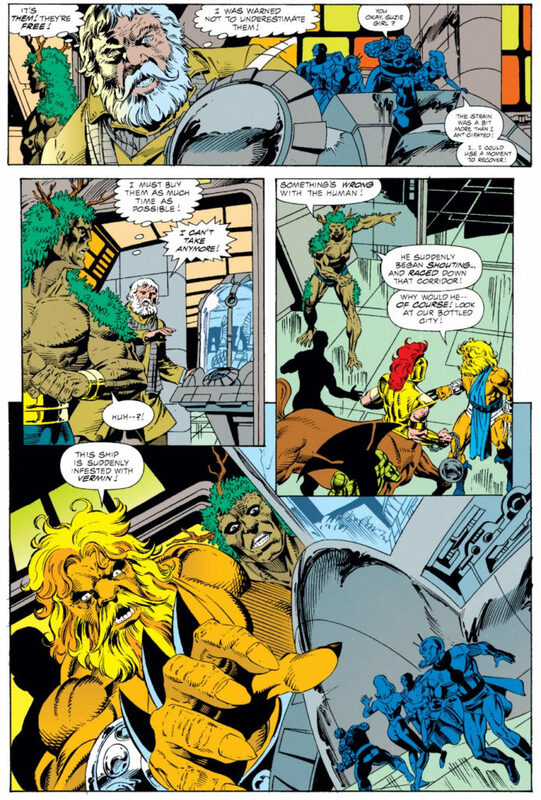 Maybe I misunderstood what you meant about Kristoff being different from previous continuity, but he seemed very much in line with where I last remember him from FF#350. Apart from being in a tube, that is, he knows he’s not Dr Doom and Doom is his hero. Have I forgotten something in the 50 issues in between? It would be a mercy.